Yesterday’s demonstration, with over 1 million participants is a strong sign of Turkish dissent towards the Islamification of the country and government inertia in the face of rising violence targeting ethnic and religious minorities. The army threatens to intervene. Opposition parties seek to invalidate Gul’s election. Istanbul (AsiaNews) – An unimaginable sea of people gathered yesterday in the European heart of Istanbul, Caglayan square, to protest attempts to Islamify the country. It is the same place where months ago a handful of people – self declared Islamists – met to contest Pope Benedict XVI’s visit to Turkey. Over a million Turks – a veritable river of red flags – gathered in a climate of peace and joy, for this demonstration organised by over 600 lay associations from right and left of the political divide. Songs, concerts and slogans of peace showed clearly that secularism is the only way to reach a real and concrete democracy. The demonstration was principally against the hypothesis of an Islamists as President and a First Lady with the veil, but not only : it was also against the governments process of reform towards an increasingly shameless Islamification, against it’s inertia regarding the cruel and brutal violence carried out tin the name of Islam against the religious and ethnic minorities in Turkey. This gigantic demonstration shows that Turkey finds itself at an important crossroads for the future of democracy in the country. 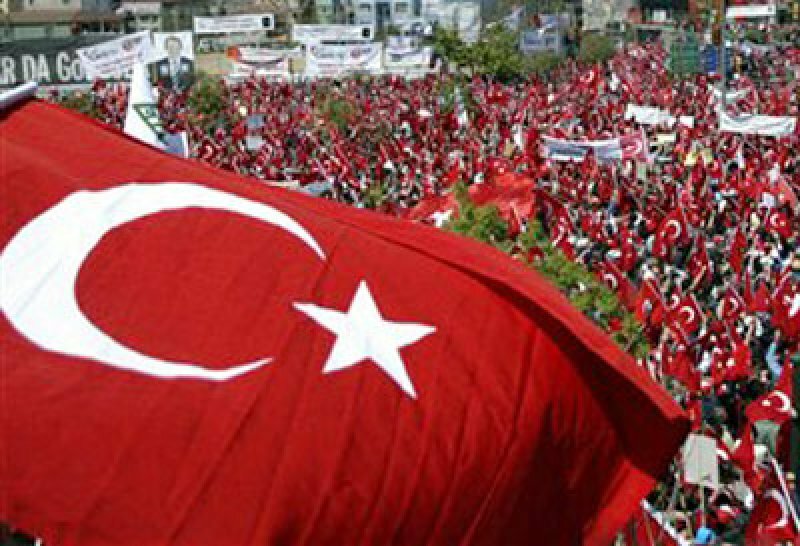 For months now there have been serious tensions regarding Turkey’s presidential elections. In reality in Turkey, the president of the Republic, elected by the Parliament, has limited powers. And yet in the collective imagination of the Turkish people, the Presidents palace in Ankara has and important and fundamental symbolic role : it represents the continuity of the secular state, wanted and nurtured by Ataturk, the founding father of the Turkish republic in 1923. For this very reason the fact that the only current candidate for the elections is a member of the Islamic Party in power at the moment has created no small amount of fear. The outgoing president Ahmet Necdet Sezer – who in the last five years has quashed no less than 150 laws promulgated by the Turkish Government, on the rounds they went against the secular nature of the state – has used apocalyptic tones: “If Gul, the current Foreign Minister obtains the presidency, then the AKP party, which has more than two thirds of parliament, will find itself in possession of all the major State posts (head of state, prime minister and parliament president) : the secular regime is in danger”. The army, which since the times of Ataturk defines itself as the guardian of kemalist ideology, have threatened massive intervention in the case of an Islamic prevarication in Turkish politics. But since1980, when the Security Forces secret services provoked the last state coup, much has changed. Relations between Turkey, the European Union and the rest of the world are very different; for this reason, military intervention could provoke unpopular and even fatal repercussions (such as those which emerged from the European Parliaments request for non intervention). But what is more important, today above all the popular conscience has changed. While on the one hand we assist at an apparent islamification of the nation and a growing dominance of fundamentalist Islamic force, on the other a strong will to defend secular democracy is also evident, as yesterdays enormous demonstration illustrates. It can only be hoped therefore that the strength of these people will win the day, this time at least. Meanwhile Prime Minister Erdogan seems to be obstinately intent on his course of action: this evening he will address the nation in defence of his choice of candidate. Abdullah Gul too has affirmed without hesitation that he will not withdraw his candidacy. An yet Friday evening (27April) there was black smoke for his nomination following his first parliamentary hearing : because of the oppositions boycott, he failed to obtain the legal majority. If it is true that in 2002 he obtained the majority of parliamentary seats, which came about thanks to the Turkish electoral system which allows the barring of small parties (above all Kurdish parties). As a result, with only 34% of the vote, 367 seats of the 550 in the national assembly were judged to his party. It however is far from representing the majority of the nation, above if we count the fact that in 2002 over 11 million people abstained from the vote. In the meantime the opposition Peoples Republican Party, (CHP) has appealed to the Constitutional Court, the bastion of secular democracy, to invalidate the presidential elections. Judges have convened for 2 days to decide on the issue before May 2nd, when the second parliamentary hearing is due to take place. If the appeal is rejected, Gul may be elected President of the Republic on the third ballot, for which only the absolute majority is necessary. Should this fail to be, Erdogan will be forced to call for a national ballot within ninety days. Then it would be for the nation to decide on the future of democracy in the Country.